Read on to learn how to get a FREE COPY of SEXTED!, now in print. Young people who sext often find themselves on the wrong side of the law–and on the wrong side of society’s bullies. Sometimes they’re even driven to commit suicide. Finn McCarthy and Josh Hadley feel like typical tenth-grade übergeeks who don’t really stand out or fit in . . . until the day Finn is texted a racy photo from an anonymous female with the tantalizing proposition: Wan 2 c mor? Feeling flattered, confused, excited, and nervous, Finn seeks the counsel of his best friend, Josh, and together they attempt to unravel the why and—most importantly—the who of this enticing message. This task proves difficult, yet it’s an intoxicating escape from the difficulties both boys face at home. Finn’s mom is an alcoholic and his dad seems to accept her destructive behavior as status quo. Josh and his sister, Paige, are children of divorce living with a mom who is always working, and an absentee dad who has news that will change their lives forever. While unraveling the mystery of these seductive texts, both Finn and Josh must face their demons and desires—and decide which risks are truly worth taking. If you know a young person who might be tempted to send a photo of his or her private parts winging through the ether, suggest he or she read this book, available in digital format and NOW IN PRINT as well. Click on the Goodreads link below to enter to win a copy of the print edition, FOR FREE. Check it out. It just might save a life. “Titillation and trauma, crushes and consequences…Coombs gets it so right.” — Deborah Halverson, editor, and author of Honk If You Hate Me and Big Mouth (YA), and WRITING YOUNG ADULT FICTION FOR DUMMIES. 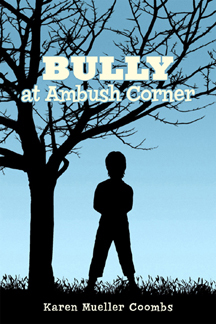 Posted by Karen Coombs on April 29, 2013 in Uncategorized and tagged Book giveaway, Bullies, Bullying, bullying and sexting, Consequences of sexting, Cyberbullying, Deborah Halverson, Free book, Goodreads, Sexting, social media, Viral media.